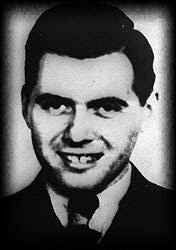 Josef Mengele, the infamous doctor of Auschwitz, commonly referred to as the "Angel of Death" (yeah, the Slayer song). His most famous role was played out as the selector on the platform at Auschwitz whose whims sent one either to the gas chambers or to the camp. "Polished boots slightly apart, his thumb resting on his pistol belt, he surveyed his prey with those dead gimlet eyes. Death to the left, life to the right. Four hundred thousand souls - babies, small children, young girls, mothers, fathers, and grandparents - are said to have been casually waved to the lefthand side with a flick of the cane clasped in a gloved hand." He carried out "medical experiments" on the people in the camp. He was especially fascinated by twins. His experiments on the prisoners were unequaled in their cruelty (such as the excision of their genital organs and a variety of harmful injections into the veins or directly into the heart).